The Active School Travel Awards sees ten schools presented with a shield for having the highest percentage of pupils in their area who walk, cycle, scooter or park and stride. 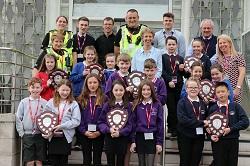 The nine primary school winners are selected from each school cluster area, while the overall secondary school winner was Hawick High School who have picked up the award eight years in a row for consistently having the highest number of pupils walking and cycling to school. Pupils and staff work closely with our Safer Routes to School team and local police officers, promoting different forms of active travel and highlighting road safety concerns. The winners are decided using information from the National School Travel Hands Up survey, which sees every nursery and school in Scotland surveyed on their travel mode to school. The results are collated by Sustrans and published as an official statistic by the Scottish Government. leaflet promoting safe parking created by pupils at Broomlands. The pupils were congratulated by Councillor Gordon Edgar, Councillor Carol Hamilton (Executive Member Children and Young People) and Councillor Scott Hamilton (Children and Young People’s Champion). “As always, it is fantastic to see so many pupils, school staff and parents making significant efforts to play their part by encouraging active travel to and from schools right across the Borders. “As a Council, we are encouraging people to be more energy efficient and these awards should instil in our young people the importance of doing everything we can to reduce our carbon footprint, as well as getting some exercise through travelling actively to school. Photographs are available on our Flickr page. Eyemouth Primary was unable to attend.